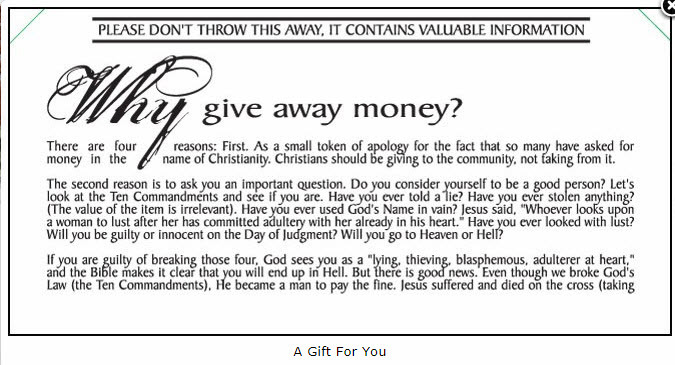 During the Thanksgiving, Christmas and New Year’s seasons, I like to give the people that I come into contact with on a regular basis, “A Gift For You, Money Within” tract. I not only stuff the tract with the Million Dollar Bill tract but also a varying monetary denomination and let them pick the card of their choosing. It’s always a joy to see their expression as they open the card but I also share with them that the message on the card is more important than the money inside. A couple of days after giving one to a Starbucks barista, she thanked me for the gift and she shared with me that it reminded her of when she was growing up that her family celebrated religious holidays and traditions, for which she was thankful. I shared with her that Jesus didn’t come to the earth for her to follow some new religion but He came to restore a lost relationship with her. When you think about it, that is what makes Christianity unique. All of the major religions are just that, religion and pretenders! It’s what a person does in order to work their way to a false god. 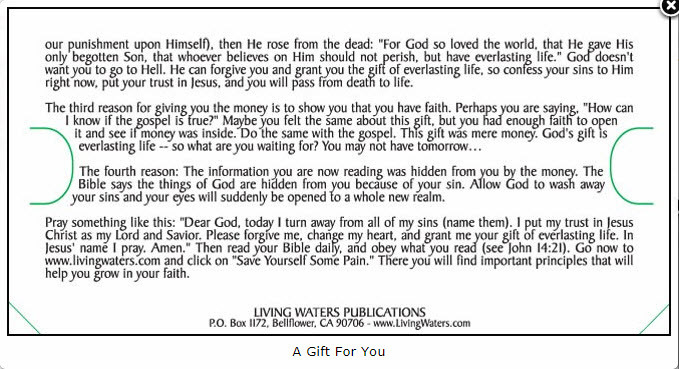 Christ came searching for us, lost sheep, so that all that believe on Him, could have eternal life. The relationship lost in the Garden of Eden, would be restored. May all of you have a Merry Christmas and blessed New Year in Christ Jesus, the LORD and glory, the only true and eternal God. We are local born-again Christians of Milwaukee Wisconsin, using our ambassadorship by preaching the gospel of Jesus Christ. We also help equip the body of Christ to witness by teaching biblical evangelism based on Scripture.